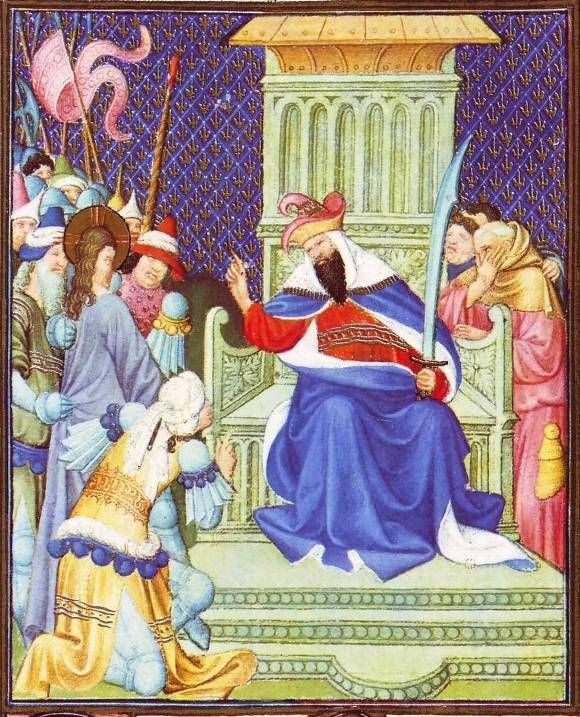 A kneeling soldier eagerly repeats the accusations to the Roman governor, who sits on a throne like that of Caiaphas’ – clearly linking the two men, one Jewish, the other Roman, in complicity. Pilate holds the sword of authority, just as Caiaphas did. Pilate raises an admonitory ﬁnger before Christ, who is held in the grasp of mailed fists. Jesus’ face seems to have been flattened: is this just damage to the paint, or is it meant to suggest the buffeting Jesus has already undergone at the hands of the soldiers? A priestly adviser to Pilate covers his mouth with his hand, as if to silence himself. The confusion of the moment is conveyed by a banner that flutters over Jesus’ head. The burning taper reminds us that is is early morning, still almost dark. And there is even more darkness to come.